With those of us in the North East shrugging off what we hope to be the last of winter’s icy grasp, at this time of year, thoughts almost immediately turn to getting outdoors. At our house, this typically includes the annual planning sessions for what vegetables or herbs to plant in the garden. What do we want to attempt to grow that might, with a little luck, wind up on the kitchen table? This year, I began wondering what I could grow that I might be able to feature in a future homebrewed beer. I think I have this impulse every year, but the thought had enough momentum in my mind that I'll likely act on it. Hops are the obvious answer. I’m sure if you polled a collection of homebrewers, the majority of them have or at least have tried growing their own hop cones. I’m certainly guilty after planting a Sterling and Centennial plant last season. But for this year, I wanted to try looking for something different. After a little searching, I decided to pick up a copy of John Peragine’s “The Complete Guide to Growing Your Own Hops, Barley, and Brewing Herbs” It seemed to cover exactly what I was looking for. Plus, I’ve heard good things about the book, and at almost 300 pages, its packed with a lot of information. So what the hell, right? I’ll report back after the book arrives and I get the chance to thumb through it for ideas. In the meantime, if anyone has the book or at least flipped through it, I would love to hear your thoughts. 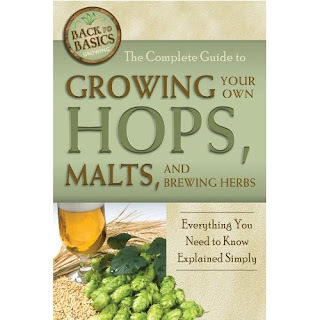 Alternatively, if there are other books or references any readers might be able to point me to on growing beer ingredients (beyond just hops), I would greatly appreciate it. "I drink with impunity ... or anyone else who invites me."